General purpose cover suitable for ceiling and broadwall applications. Fabric has been selected for its ability to hold paint providing greater coverage, durability and ease of cleaning. Ideal use for water based paints but suitable with all paints on smooth and semi-smooth surfaces. Wash the roller in either water or solvent (depending on the paint being used), then roll it out to remove loose particles and dust. Remove the roller from the frame immediately after you’ve finished painting. Do not allow the paint to dry on the roller. Remove excess paint from the roller and then wash as follows, depending on the paint type used. Wash roller out in warm soapy water. Rinse in clean water, spin to dry and then stand roller on its end to air dry in the shade. Do not squeeze the roller dry. Do not leave the roller to soak in water or solvent. Do not wrap up or bag the roller with paint still on it. 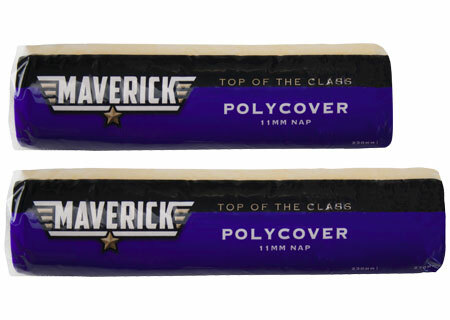 Following the cleaning and storage instructions will result in your Polycover roller having a long lifespan. Available in 230mm (with an 11mm Nap) and 270mm (with an 11mm and 18mm Nap).